Magnetic Grill provide a high intensity high gradient magnetic field to remove ferrous metals from free-flowing materials. Grate Magnets are available in round, square, and rectangular shapes as per your requirement. It is used in or below hoppers, in closed chutes, floor openings, catch bins, and other locations to protect processing equipment and insure product purity. These grids encased totally in stainless steel. For higher level of protection, double and triple banked grids can be used. All grids are available with either ferrite or powerful rare earth magnets. Our expertise lies in offering quality assured Magnetic Grills. For effective cleaning, These grills are mounted with zig zag position of the pulley above each other. By pulling magnetic elements, the ferrous material cab is removed in case of self-clearing grills. These offered grills are available in various sizes and shapes that help in meeting the diverse requirements of our clients. 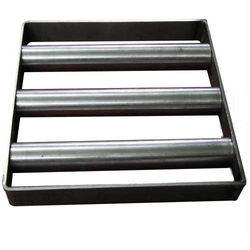 We also offer Drawer Type Magnetic Grill, These grills can be installed in existing hoppers, pipe line or outlet of different products such as pulverizer, blenders or any other outlet location. Elements are installed at specific distance, in standard type single magnetic row. Whereas, to ensure effective clearing, the magnetic elements are mounted with zig zag position above each other in multilayer type magnetic grills. 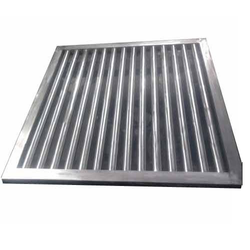 Ferrous material can be removed, in self clearing grills by pulling the magnetic elements. Drawer-in-housings are used primarily in vertical chutes for removal of free flowing bulk materials. The drawer in housing designs are offered in simple, inexpensive manually cleaning designs, easy clean, or air or electrically actuated automatically cleaning designs. Food grade finish is available as is any number of tube configurations to optimize the design for your product. The standard tube configuration is staggered so the material must flow around the tubes and tramp metal removal is maximized. To clean manually clean drawer in housings, simply unlatch and remove the drawer and wipe the tubes with a rag or gloved hand. Easy clean models are cleaned manually, simply by unlatching and pulling a handle. The easy clean model is a good compromise between manually cleaning and automatically cleaning. Auto clean drawer in housings can be cleaned by the push of a button or cycled via a timer that is controlled by the system controller or separate timer relay. Common uses for drawer in housings are for sugar, plastic pellets, carbon black, shot, and many other free flowing products. Location should be considered when deciding on a cleaning method. Looking for Magnetic Grills ?